Imagine having the power of hypnosis – coupled with Neuro Linguistic Programming behind you – as you work. You can achieve amazing results after listening to this easy-to-understand guide to Sales Mastery! One such skill attained through hypnosis is mastering the art of the sale. We’ve all seen the type of person that gets labeled a natural salesman. This person knows what to say, how to say it and when to let the other person make their decision of whether or not buy into what they are selling – be it a purchase or an idea. Those skills are sometimes natural, but often fine tuned and perfected through education and training. That “innate” ability can become anyone’s through hypnosis. Steve G. Jones, Board Certified Hypnotherapist, has developed an audio book program that can teach you the ins and outs of NPL and basic hypnotic techniques. His audio book, Hypnotic Sales Mastery Techniques focuses on the kind of linguistic programming that makes a great sales person. Knowing how others think and respond to sales messages is the key to successful sales. 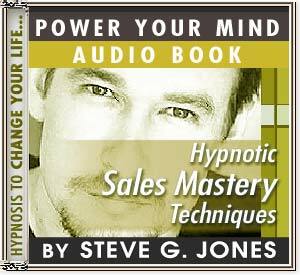 Steve G. Jones charges $1,700 for the 12-week Certified Clinical Hypnotist course at his hypnosis school, the world-famous Steve G. Jones School of Clinical Hypnosis, but now he shares his techniques in this conversational-style audio book. You can and will become a master of selling when you use this audio book. Steve will give you thousands of hypnotic techniques for you to use to land that sale! You will become a sales master…it is that easy. This audio book contains tools and hypnotic techniques that are easy to understand and apply to any sales situation. You can even apply these techniques to other parts of your life! The Hypnotic Sales Mastery Techniques will change your life! Steve G. Jones has helped thousands of people improve their career and financial success with this audio book. You do not want to miss out!